Statue of General Sudirman is located is in the middle of the road at the north end of Jalan Jenderal Sudirman, South Jakarta. 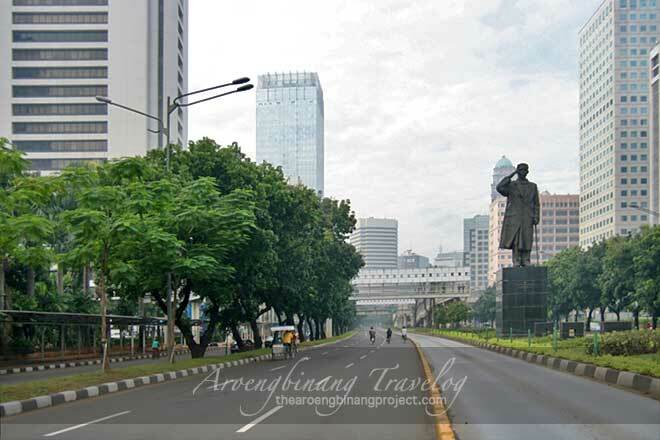 The statue is placed in one of the two most prestigious streets in DKI Jakarta, besides Jl MH Thamrin which is the connecting street, made facing towards the State Palace, maybe as a symbol of loyalty to the supreme leader of NKRI (The Unitary State of the Republic of Indonesia). 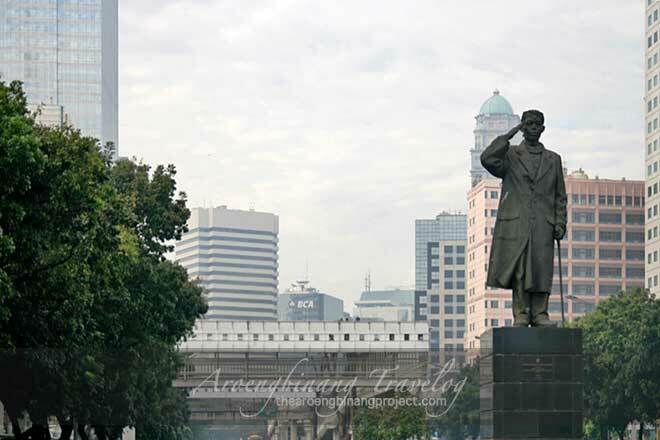 General Sudirman statue featuring a figure in his typical outfit is flanked by four tall buildings, namely Wisma Arthaloka and BNI Building on the West side, as well as Landmark Building and Wisma Indocement on the East side. In addition to his long coat to protect his frail body from lung disease, a blangkon (a traditional Javanese headdress worn by men and made of batik fabric) also decorates his head. Despite living with only one lung, but the spirit and loyalty of the general in the struggle to defend the Unitary Republic of Indonesia from the grip of the invaders were able to overcome his weak physical limitations. It was proved when the Dutch launched Military Aggression II to occupy Yogyakarta on 19 December 1948, just days after Soedirman was discharged from hospital. 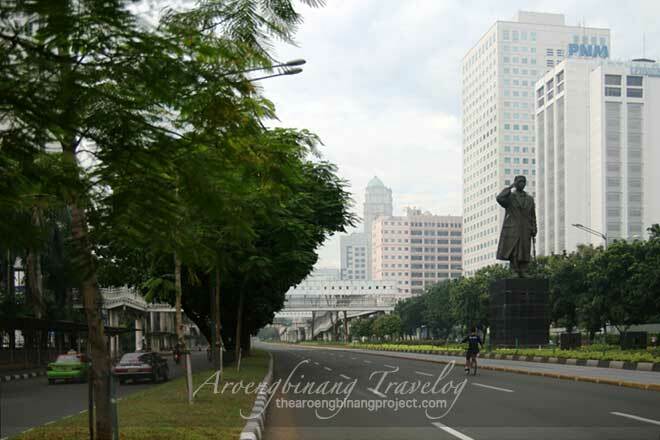 On a Sunday morning, at about six-thirty, a man on small bicycle was seen passing by the Statue of General Sudirman. The street was still quiet. People were still on the way to this place to enjoy the daze of the road during the car-free day along Jalan Sudirman - Thamrin. The photo was taken long before the start of the MRT project that made the prestigious street landscape changed with the loss of most shade trees. The construction of MRT which has been planned for many years, finally can be realized its development since Joko Widodo become Governor of DKI Jakarta. 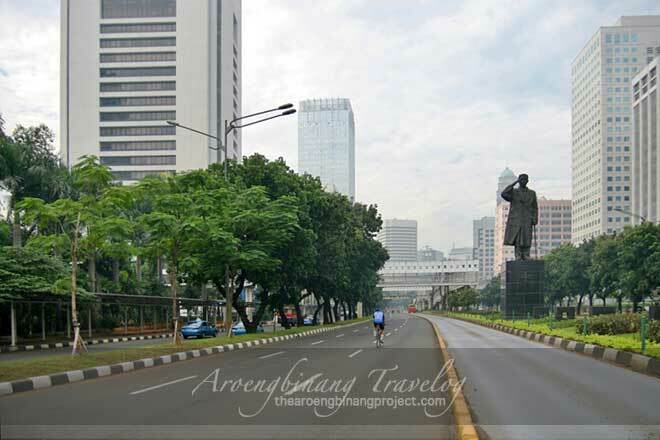 Other cyclists were seen to stroll casually on a quite street beside Statue of General Sudirman. Only in the slow lane cars can still pass during the car free day. Meanwhile, on the opposite side, a red TransJakarta bus was passing by. The middle line of Jakarta City from Kota area to Jl Medan Merdeka Barat - Jl MH Thamrin - Jl Jenderal Sudirman to Jl Fatmawati and so on until Jl Lebak Bulus is the busiest lane because of many office areas, restaurants and entertainment venues. So it can be understood that the construction of MRT is prioritized first in this road corridor. A close look at the General Sudirman Statue with his left hand holding a stick. Soedirman was the first army military figure to gain the rank of Great General in 1997. The highest rank that an Army officer could achieve was also attributed to Great General AH Nasoetion and General Soeharto. The construction of General Statue Sudirman and a number of other sculptures appeared in September 2001, as the realization of hero statues contest that was carried out in 1999. The making of General Sudirman statue was done by Sunario, artist and lecturer of art school of ITB, at a cost of Rp. 6.6 billion of which funds come from businessmen's contributions by compensating two advertisement points in Dukuh Atas. Statue of General Sudirman and Jakarta that was still quiet. When prominent political leaders took refuge in Jogja Palace during the Second Dutch Military Aggression, Soedirman along with a small group of soldiers and his personal physician fled out of the city to the south and waged a guerrilla war against the Dutch army for seven months. He established a temporary headquarters in Sobo, near Mount Lawu, to command military operations on Java, including the March 1, 1949 General Offensive to Jogjakarta City led by Lieutenant Colonel Soeharto. Soedirman returned to Yogyakarta in July 1949 when the Dutch army began to withdraw. The inauguration of General Sudirman Statue made of bronze weighing 4 tons as high as 6.5 meters with a buffer as high as 5.5 meters was conducted on August 16, 2003. There was controversy on the statue that seemed to respect the pedestrian. The general, however, saluted the State Palace, the place where the President of the Republic of Indonesia resides as a form of loyalty to the Unitary State of the Republic of Indonesia. Soedirman was born in Purbalingga on January 24, 1916, died on January 29, 1950 at the age of 34 with the rank of Lieutenant General, was buried in Semaki Hero Cemetery, Jogjakarta. Awarded the rank of posthumous general in that same year. Before he was elected as commander of the TNI, he served as Commander of Banyumas PETA Army and Commander of Division V TKR Banyumas. 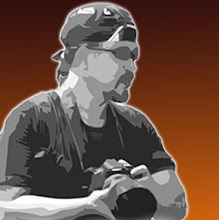 Address : Jl Jenderal Sudirman, Jakarta Selatan. GPS Location : -6.2041919, 106.8224286, Waze ( smartphone Android and iOS ). Reference : Map of Jakarta . Destinations in Jakarta . Hotel in Central Jakarta. Label : Jakarta, Monument, South Jakarta, Travel.